FAMILIES across Northern Ireland are being plunged into debt because of the rising cost of funerals coupled with dwindling government support, organisations working with the bereaved have warned. In the five years to 2016/17 there were 18,219 applications for a Funeral Payment, which provides financial assistance for people in receipt of benefits “towards a simple, respectful, low-cost funeral”. The average payment during that timeframe was £1,037 – leaving families on low incomes with a shortfall of around £2,000 for the cost of a basic funeral based on figures from insurance company, Sunlife. Although families who receive a Funeral Payment do not have to repay the money, the state tries to recover all Funeral Payments from the estate of the deceased. However, £16million of debt has been written off. Of the applicants for Funeral Payments, 11,964 were successful in their claim. 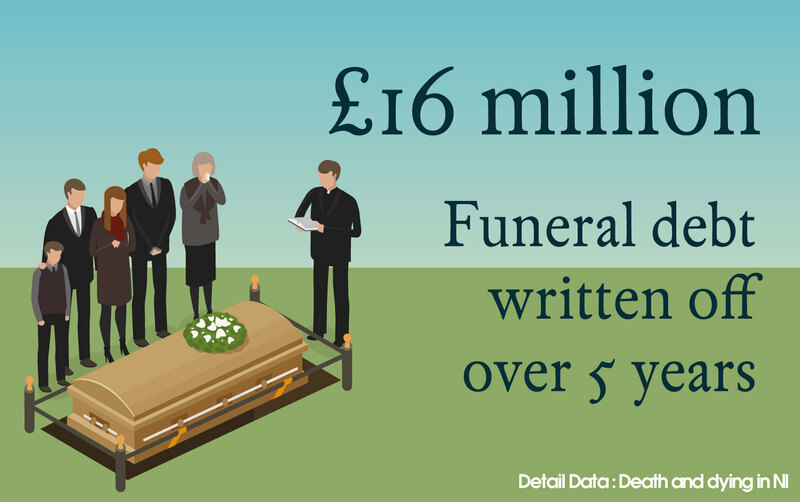 The award covers burial costs – however a maximum of £700 is available towards the cost of a coffin, cars, flowers, funeral director’s fees etc. Costs in excess of that have to be met by the family. “Undoubtedly this does cause extra distress to families,” said Gary Haire, NI president of the National Association of Funeral Directors (NAFD). Citizens Advice Northern Ireland told Detail Data of two examples of people they supported who had been forced into debt following the death of a relative. In one case a mother-of-four who was in receipt of benefits received £1,000 Funeral Payment towards her mother’s funeral, which cost £3,000. While a pensioner who had no source of income was left “very distressed” after her brother’s funeral bill came to £2,200. She received a £1,200 Funeral Payment but had no means of paying the remaining balance of £1,000. Antrim mother-of-four Siobhan McLaughlin – also with the help of Citizens Advice - applied for a Funeral Payment to help with the cost of her partner, John Adam’s funeral. However, like so many families the benefit didn’t cover the full cost of the funeral so she had to turn to family for help, in her case her mother. Charities and organisations dealing with the bereaved have called for an urgent review of the amount awarded through a Funeral Payment, which falls under the remit of the Department for Communities (DfC). Since 2004 the cost of a basic funeral in Northern Ireland has risen by 88%, however, Funeral Payments haven’t increased since 2003. The Department carried out a consultation exercise last year relating to proposed reforms of the Funeral Expenses Payment scheme including clarifying issues around eligibility and simplifying the process. However, there will no no increase in the level of payout. A spokesman said: "The Department will now move to make and introduce the necessary regulations to introduce the changes, in line with GB, on 2 April 2018." The National Association of Funeral Directors attributed rising funeral costs to "local authorities placing huge rises on burial and cremation costs". A spokesman claimed: "Most funeral directors have either not increased their fees at all, or have done so in line with or less than inflation, but are also facing rises in staff costs. "Increasingly people want very specific things and types of ceremony. There is a move towards memorialisation and personalisation in funerals, and this generally adds to the cost of the older, more formulaic funeral." Marie Curie, which provides care and support for 4,000 people a year with a terminal illness in Northern Ireland, has serious concerns about funeral costs. Head of policy and public affairs for Northern Ireland, Joan McEwan, said: “We believe everyone has the right to a dignified funeral and one that does not put their loved one in debt. The National Association of Funeral Directors has also raised with elected representatives and civil servants in Northern Ireland the issue of Funeral Payments. Data from DfC’s Annual Report on the Social Fund shows that between 2012/13 and 2016/17 Funeral Payments helped people on low-incomes bury 11,964 loved ones, which Marie Curie says “highlights the real need that there is out there for people struggling just to cover the cost of a basic funeral”. Of the people who received help towards the cost of a funeral 42% were pensioners, 11.5% were described as unemployed and 5% as lone parents. Charities warn these figures are only the tip of the iceberg as families just above the benefits threshold, and therefore exempt from receiving Funeral Payments, are also struggling with the cost of dying. Sarah McCully Russell explained: “There’s a cultural side to death in Northern Ireland; people want a good send-off and that puts a lot of pressure on people, especially when it comes to finances. When people find themselves in this situation it’s known as funeral poverty. Heather Kennedy from the Fair Funerals Campaign explained: “Funeral poverty is where the price of a funeral is beyond a person’s ability to pay. New figures show that government spending on Funeral Payments in Northern Ireland has reduced from £2.7million in 2012/13 to £2.29million in 2016/17. A Department for Communities spokesman said: "The Funeral Expenses Payment Scheme in Northern Ireland corresponds to that for Great Britain. Any deviation from this in Northern Ireland would have significant implications in relation to the principle of parity in social security provision and would have to be funded out of the Executive’s budget. "The Department believes that the Social Fund Funeral Expenses Payment Scheme makes a significant contribution towards the cost of a simple, low cost respectful funeral. Whilst it is accepted that the costs associated with a funeral cannot always be met in full through the Funeral Expenses Payment Scheme, interest-free Social Fund Budgeting Loans are available to help meet additional funeral costs." Department for Communities Data relating to Funeral Payments also reveals that thousands of people in Northern Ireland are dying every year without having enough money to cover the cost of their funeral. A Funeral Payment has to be paid back from the estate of the person who has died. However, the Social Security Agency admits “in the majority of the cases the estate is insufficient for the Funeral Payment to be recovered”. That is backed up by the data which shows between 2012/13 and 2016/17 £16million in funeral payment debt was written off by the Social Security Agency. During that period the number of cases written of was 15,947. To return to the links for all today's stories click here.